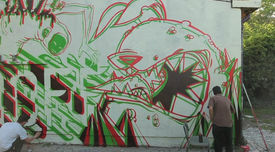 New fresh Graffiti 3D concept by the ON OFF Crew. We put together the English subtitles so everyone can get to know the amazingly talented OnOff members and their working style. We have to admit, the FatCap English team cannot keep up with FatCap France as they cover the beyond talented OnOff Crew. Here are the highlights.